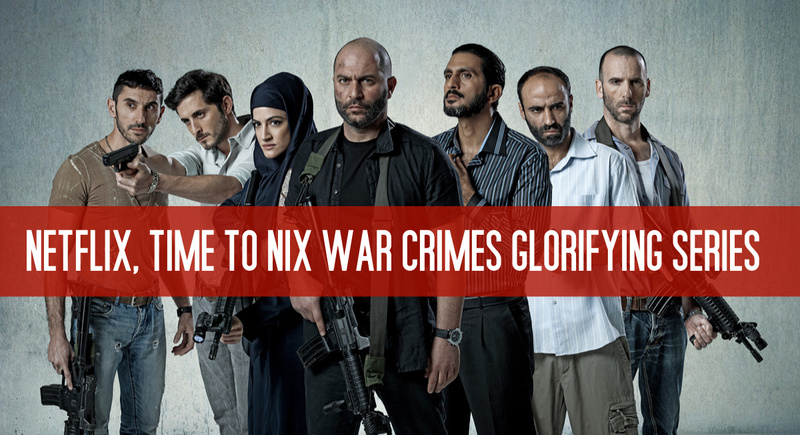 Occupied Ramallah, March 29, 2018 — The Palestinian Campaign for the Academic and Cultural Boycott of Israel (PACBI) calls on Netflix to nix the “thriller” series “Fauda,” as it is an anti-Arab racist, Israeli propaganda tool that glorifies the Israeli military’s war crimes against the Palestinian people. Failing to do so will open Netflix to nonviolent grassroots pressure and possible legal accountability. PACBI is an integral part of the nonviolent BDS movement for Palestinian freedom, justice and equality. The movement has been nominated for a Nobel Peace Prize. Adding insult to injury, Netflix is scheduled to release season two this coming May, which marks the 70th anniversary of the 1948 Nakba, Israel’s mass expulsion of most of the indigenous Palestinians from their homes and the destruction of hundreds of their towns and villages. Historians, including prominent Palestinian and Israeli scholars, have documented this systematic and deliberate campaign of ethnic cleansing. The series “Fauda” promotes and legitimizes violent acts committed against Palestinians in the occupied Palestinian territory by Israeli army death squads -- the so-called “Mistaravim.” The show’s writers, who were members in these units, have based the series on the war crimes committed by these squads against Palestinians. For instance, the “Yasam” secret unit of the Israeli army, which “inspired” Fauda’s creators, operates undercover in civilian Arab disguise, which amounts to “perfidy”, a war crime under international humanitarian law. It is also responsible for numerous targeted assassinations, extrajudicial executions, and the murder and brutally violent arrest of unarmed Palestinian demonstrators, including young children. In addition, it repeatedly violates the sanctity of Palestinian universities and hospitals. These acts also constitute war crimes in international law. Last month, Israeli president Reuven Rivlin hosted a celebratory gathering that brought together Fauda’s crew with leaders of the undercover death squad “Yamas” and hundreds of Israeli soldiers. At the gathering, the series’ crew expressed their gratitude to Yamas as the “source of inspiration” for the series and as the “protectors of life”. Rivlin expressed his “gratitude” for and “pride” in the series. The Israeli military and political establishment’s embrace and promotion of “Fauda” reveals its significant role in Israel’s branding efforts, as well as its propaganda campaign to cover up its war crimes against the Palestinian people. Based on the above, PACBI calls on Netflix to suspend its production of season three of the series, to refrain from releasing season two, and to remove season one from its service. Dumping Fauda would not be a precedent for streaming services like Netflix and HBO. With the growth of the #MeToo movement, Netflix has suspended its work with actor Kevin Spacey after he was accused of sexual misconduct. It produced the last season of House of Cards without his or his character’s participation. The service also said it would not release Gore, a film that Spacey produced and acted in. Netflix, HBO and other streaming services severed ties with the comedian Louis C.K. after he was accused of sexual misconduct. HBO removed all his projects from its service. Film distributor The Orchard canceled the release of his film. And Disney redubbed his voice in an animated series he previously took part in. Netflix established a social responsibility standard by ending its collaboration with Kevin Spacey and Louis C.K. That standard must now include refusing to host a series that legitimizes and promotes racist violence and war crimes. Freedom of expression is protected by the First Amendment of the US Constitution. But this protection does not apply to justification of and incitement to “imminent lawless action,” including Israel’s ongoing racial violence and egregious human rights violations against Palestinians. Netflix, do the right thing and nix Fauda!